Secret Of The Stones slot machine is a mystical themed NetEnt game that is very loosely based on the world famous Stonehenge. The mobile slot has 5 reels, 25 paylines and a reasonable max jackpot of 1,250 considering its low variance, but where the game comes to life if with is bonus feature which gives players up to 29 free spins and a 5x multiplier the create some very big wins. All the details can be found in the Secret Of The Stones slot review below. Fasten your seatbelts and prepare for a white-knuckle ride in NetEnt’s Secret Of The Stones slot, a medium high-variance game that features a mystical theme and potentially lucrative free spins bonus. Boasting five reels and 25 fixed paylines, the Secret Of The Stones slot machine takes place in front of a backdrop of a moss-covered forest shrouded in mist. The reels themselves are carved in stone and feature an array of Celtic symbols, with beautifully designed owls, deer, bulls, sheep and snakes accounting for the game’s higher value icons. A druid features as a substitute wild, while a tree triggers the main bonus. Playable from as little as £0.25 per spin, Secret Of The Stones can be enjoyed across all desktop, mobile and tablet devices and boasts a fairly reasonable base game jackpot of 1,250x players’ bet per line amount. This can be further boosted to 6,250x courtesy of the free spins feature’s 5x prize multiplier, while additional wild symbols and completely wild reels can also contribute to their wins. 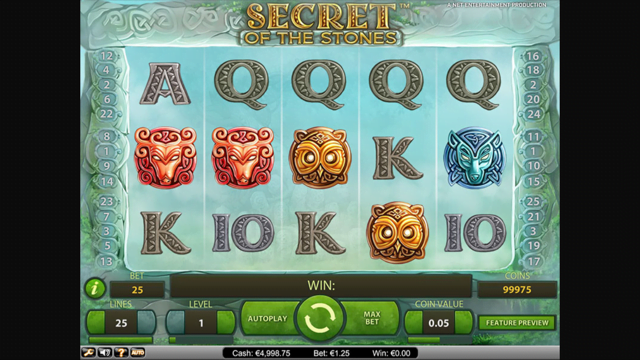 Although Secret Of The Stones only includes one main bonus feature, as you’d thoroughly expect from a NetEnt slot, it is a good one that can be hugely rewarding if players pick wisely. Activated by landing three or more tree scatter symbols, players will be transported to a screen depicting 20 carved stones and will get to make a number of choices dictated by the triggering symbols they land. As a starting point, players will receive 10 free spins before the feature begins with no multiplier in effect, but each stone picked can award a potentially lucrative modifier. Among the prizes on offer, players will find additional bonus games, multipliers between 2x and 5x, additional owl and deer wild symbols and even an option that turns either the second or fourth column into a full stack of wilds. In terms of the maximum rewards available, the right set of picks can result in players receiving up to 29 free spins, the maximum 5x multiplier or any combination of wild reels and extra substitute wilds. Although a simple enough game, the Secret Of The Stones slot is not for the faint of heart. The free spins feature can potentially deliver big wins, but you’ll have to survive the base game to make top dollar. Like the Secret Of The Stones slot review? Check out these as well…..